You are here: Home / Our Animals / Chickens / Got Chickens Molting? Here’s What To Do. Got Chickens Molting? Here’s What To Do. Molting chickens can be stressful because, well, your flock looks naked and like they’re unhealthy. So, how often do chickens molt? How long does molting last? 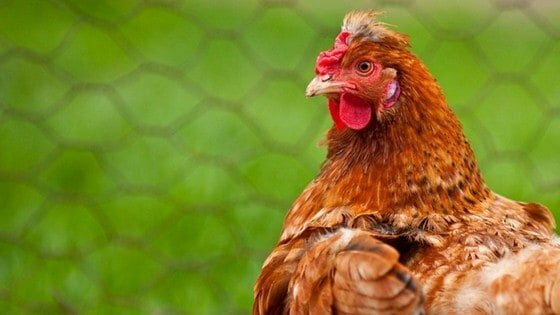 What should I feed a molting hen or rooster? When we say “chickens molting,” you might wonder what that really means. It’s a term you see thrown around on Facebook, but it can be confusing if you’re a beginner with chickens. Basically, when we say “chickens molting,” we mean that your hens and roosters are losing their feathers. Don’t worry – they’ll grow new ones, and chickens molting is perfectly normal. Inconveniently, chickens tend to molt in the late fall or early winter; breeding season is over, and your flock will start to grow new feathers. As your chickens get more and more “naked,” you’ll probably worry that your flock is cold (they might be and you’ll have to find a way to keep them warm). Chickens start molting typically in the winter after their first year (in case you wondered “when do chickens molt for the first time? – it’s a typical question new owners ask). Your mileage will vary; while some people have chickens that look like they’ve had every feather removed, I’ve personally never had a hen lose more than a few feathers. We live in an area where the winters are mild, so maybe that has something to do with it! 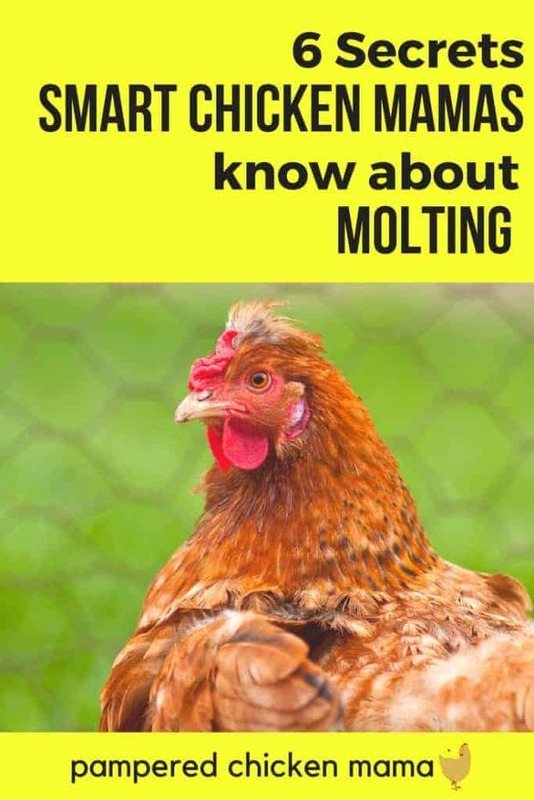 Almost universally, when I encounter a new backyard flock owner who has chickens molting, I’m asked “how long does chicken molting last?” and the answer probably won’t satisfy you. Truthfully, only your chickens know how long they’ll be molting for. We’ve had it last 2 weeks and up to 6 months. Most molting seems to last 60 to 90 days, from the time the hens start to lose their feathers to completely regrowing new ones. During this time, as your hens regrow their feathers, they’ll be more physically sensitive than normal. As the feathers start to peek out, this new growth is called “pin feathers.” Touching them can hurt your chickens. When the feathers finish growing, though, your hens won’t be so sensitive, and you can pick them up and pet them as you normally would. You might be tempted to provide a sweater or saddle for molting chickens, but it’s best to just let nature take its course. If it’s very cold out, you can find another way to keep your flock warm. When your chickens start to lose their feathers, it can seem similar to a mite infestation. However, the two present differently, so using these rules of thumb, you can confidently know whether your chickens are molting or if there’s a more serious issue. When chickens molt, they lose feathers in a systematic, predictable fashion: From the top of their heads, then their necks, and then on down until they lose their tail feathers. If you think your problem is mites and not chickens molting, you’ll usually see feather loss around the vent, the tail, or other areas; it’s not in a predictable pattern. You’ll also notice their skin is red and irritated, and possibly flaky. Your molting chickens’ diet is extremely important. To grow feathers, your flock needs lots and lots of protein. In addition to a high quality layer feed (you can get my favorite feed recipe here), you’ll want to give your chickens extra protein. Mealworms (or suet cakes made with mealworms) are a good supplement. You can also feed raw, unsalted nuts, kelp, freshwater shrimp, grubs, or crickets. or offer the extra protein separately. Molting chickens also need plenty of fresh water! Having just watched your video I have a question for you. In the UK we are getting deep into autumnal weather and I give my hens a warm breakfast to get their day of to a good start, usually porridge (oatmeal to you). About every three days I cook Do think I would be OK if I bump up the protein by adding a good dollop if unsalted peanut butter to the mix? Hi Viv, you can add the peanut butter, but i would only go with homemade since the store bought stuff might have preservatives or other stuff that we might not be aware is in it. I know you guys have stricter food regulations than we do in the US though. Can you feed them whole unsalted peanuts?